Cooking this dishes, you need 30 minutes preparing time and at least 7 hours cooking time. This time actually to process and cook rendang beef, rendang spices and coconut milk into dry .But believe me, it is worth the efforts! 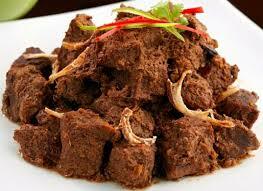 From northern part of Indonesia (Padang), most Western people love this dish very much. They try so badly to find the exotic spices in their home country! Serve with rice and acar. In a blender or food processor combine the chilis, onion, ginger, garlic, lemongrass, tamarind paste, 1 cup warm water, and the spices. Puree until smooth, then pour over the beef. Stir in the coconut milk and cook, covered, on the low setting for 5-6 hours. The beef will be tender and the sauce will be dark brown. Ladle most of the sauce into a small saucepan and cook over medium high heat to reduce until slightly thickened, about 30 minutes. Pour the sauce back in the cooker and cook on high for 30 minutes to 1 hour longer. Stir in the sugar and season with salt to taste.